In machine learning, Feature selection is the process of choosing variables that are useful in predicting the response (Y). It is considered a good practice to identify which features are important when building predictive models. 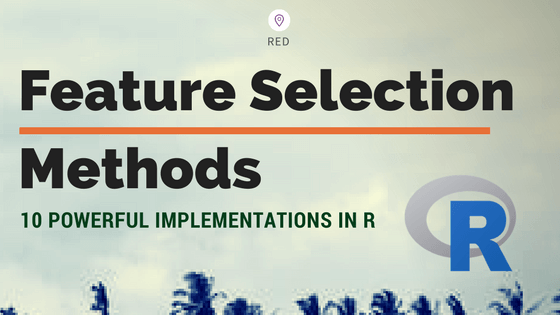 In this post, you will see how to implement 10 powerful feature selection approaches in R.
In real-world datasets, it is fairly common to have columns that are nothing but noise. You are better off getting rid of such variables because of the memory space they occupy, the time and the computational resources it is going to cost, especially in large datasets. Sometimes, you have a variable that makes business sense, but you are not sure if it actually helps in predicting the Y. You also need to consider the fact that, a feature that could be useful in one ML algorithm (say a decision tree) may go underrepresented or unused by another (like a regression model). Having said that, it is still possible that a variable that shows poor signs of helping to explain the response variable (Y), can turn out to be significantly useful in the presence of (or combination with) other predictors. What I mean by that is, a variable might have a low correlation value of (~0.2) with Y. But in the presence of other variables, it can help to explain certain patterns/phenomenon that other variables can’t explain. In such cases, it can be hard to make a call whether to include or exclude such variables. An important caveat. It is always best to have variables that have sound business logic backing the inclusion of a variable and rely solely on variable importance metrics. Alright. Let’s load up the 'Glaucoma' dataset where the goal is to predict if a patient has Glaucoma or not based on 63 different physiological measurements. You can directly run the codes or download the dataset here. A lot of interesting examples ahead. Let’s get started. Boruta is a feature ranking and selection algorithm based on random forests algorithm. 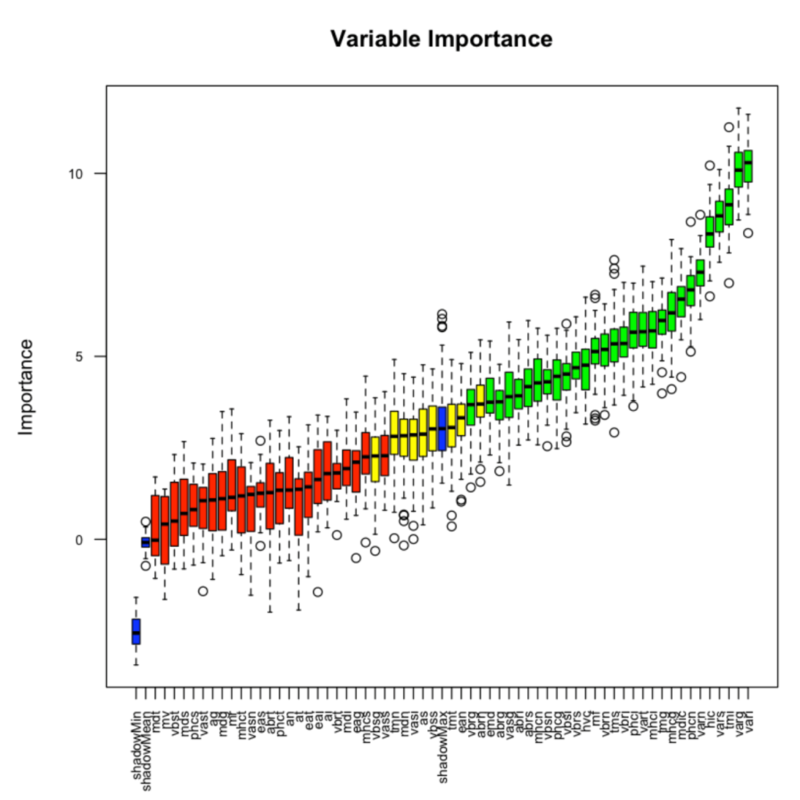 The advantage with Boruta is that it clearly decides if a variable is important or not and helps to select variables that are statistically significant. Besides, you can adjust the strictness of the algorithm by adjusting the p values that defaults to 0.01 and the maxRuns. maxRuns is the number of times the algorithm is run. The higher the maxRuns the more selective you get in picking the variables. The default value is 100. In the process of deciding if a feature is important or not, some features may be marked by Boruta as 'Tentative'. Sometimes increasing the maxRuns can help resolve the 'Tentativeness' of the feature. Lets see an example based on the Glaucoma dataset from TH.data package that I created earlier. The boruta function uses a formula interface just like most predictive modeling functions. So the first argument to boruta() is the formula with the response variable on the left and all the predictors on the right. By placing a dot, all the variables in trainData other than Class will be included in the model. The doTrace argument controls the amount of output printed to the console. Higher the value, more the log details you get. So save space I have set it to 0, but try setting it to 1 and 2 if you are running the code. Finally the output is stored in boruta_output. Let’s see what the boruta_output contains. "as"   "ean"  "abrg" "abrs" "abrn" "abri" "hic"  "mhcg" "mhcn" "mhci"
 "phcg" "phcn" "phci" "hvc"  "vbss" "vbsn" "vbsi" "vasg" "vass" "vasi"
 "vbrg" "vbrs" "vbrn" "vbri" "varg" "vart" "vars" "varn" "vari" "mdn"
 "tmg"  "tmt"  "tms"  "tmn"  "tmi"  "rnf"  "mdic" "emd"
If you are not sure about the tentative variables being selected for granted, you can choose a TentativeRoughFix on boruta_output. "abrg" "abrs" "abrn" "abri" "hic"  "mhcg" "mhcn" "mhci" "phcg" "phcn"
 "phci" "hvc"  "vbsn" "vbsi" "vasg" "vbrg" "vbrs" "vbrn" "vbri" "varg"
 "vart" "vars" "varn" "vari" "tmg"  "tms"  "tmi"  "rnf"  "mdic" "emd"
There you go. Boruta has decided on the ‘Tentative’ variables on our behalf. Let’s find out the importance scores of these variables. Let’s plot it to see the importances of these variables. This plot reveals the importance of each of the features. The columns in green are ‘confirmed’ and the ones in red are not. There are couple of blue bars representing ShadowMax and ShadowMin. They are not actual features, but are used by the boruta algorithm to decide if a variable is important or not. Another way to look at feature selection is to consider variables most used by various ML algorithms the most to be important. Depending on how the machine learning algorithm learns the relationship between X’s and Y, different machine learning algorithms may possibly end up using different variables (but mostly common vars) to various degrees. What I mean by that is, the variables that proved useful in a tree-based algorithm like rpart, can turn out to be less useful in a regression-based model. So all variables need not be equally useful to all algorithms. So how do we find the variable importance for a given ML algo? train() the desired model using the caret package. Then, use varImp() to determine the feature importances. You may want to try out multiple algorithms, to get a feel of the usefulness of the features across algos. # Train an rpart model and compute variable importance. Only 5 of the 63 features was used by rpart and if you look closely, the 5 variables used here are in the top 6 that boruta selected. Let’s do one more: the variable importances from Regularized Random Forest (RRF) algorithm. # Train an RRF model and compute variable importance. The topmost important variables are pretty much from the top tier of Boruta‘s selections. 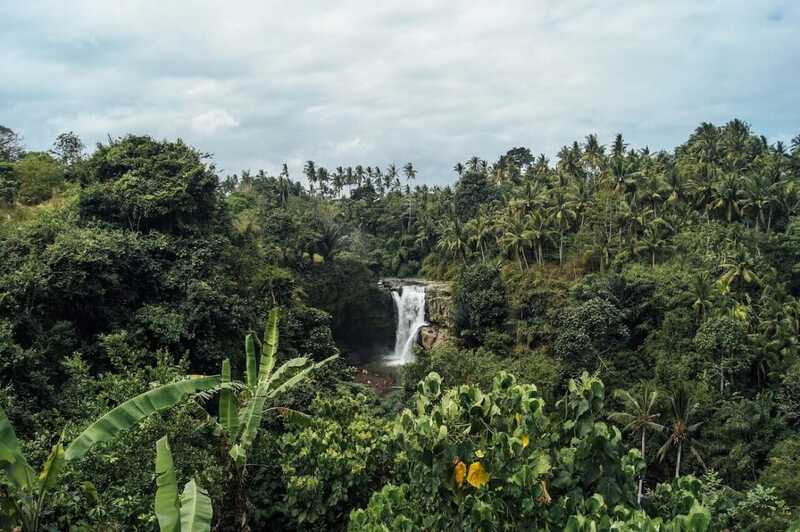 ada, AdaBag, AdaBoost.M1, adaboost, bagEarth, bagEarthGCV, bagFDA, bagFDAGCV, bartMachine, blasso, BstLm, bstSm, C5.0, C5.0Cost, C5.0Rules, C5.0Tree, cforest, chaid, ctree, ctree2, cubist, deepboost, earth, enet, evtree, extraTrees, fda, gamboost, gbm_h2o, gbm, gcvEarth, glmnet_h2o, glmnet, glmStepAIC, J48, JRip, lars, lars2, lasso, LMT, LogitBoost, M5, M5Rules, msaenet, nodeHarvest, OneR, ordinalNet, ORFlog, ORFpls, ORFridge, ORFsvm, pam, parRF, PART, penalized, PenalizedLDA, qrf, ranger, Rborist, relaxo, rf, rFerns, rfRules, rotationForest, rotationForestCp, rpart, rpart1SE, rpart2, rpartCost, rpartScore, rqlasso, rqnc, RRF, RRFglobal, sdwd, smda, sparseLDA, spikeslab, wsrf, xgbLinear, xgbTree. Least Absolute Shrinkage and Selection Operator (LASSO) regression is a type of regularization method that penalizes with L1-norm. It basically imposes a cost to having large weights (value of coefficients). And its called L1 regularization, because the cost added, is proportional to the absolute value of weight coefficients. As a result, in the process of shrinking the coefficients, it eventually reduces the coefficients of certain unwanted features all the to zero. That is, it removes the unneeded variables altogether. So effectively, LASSO regression can be considered as a variable selection technique as well. Let’s see how to interpret this plot. 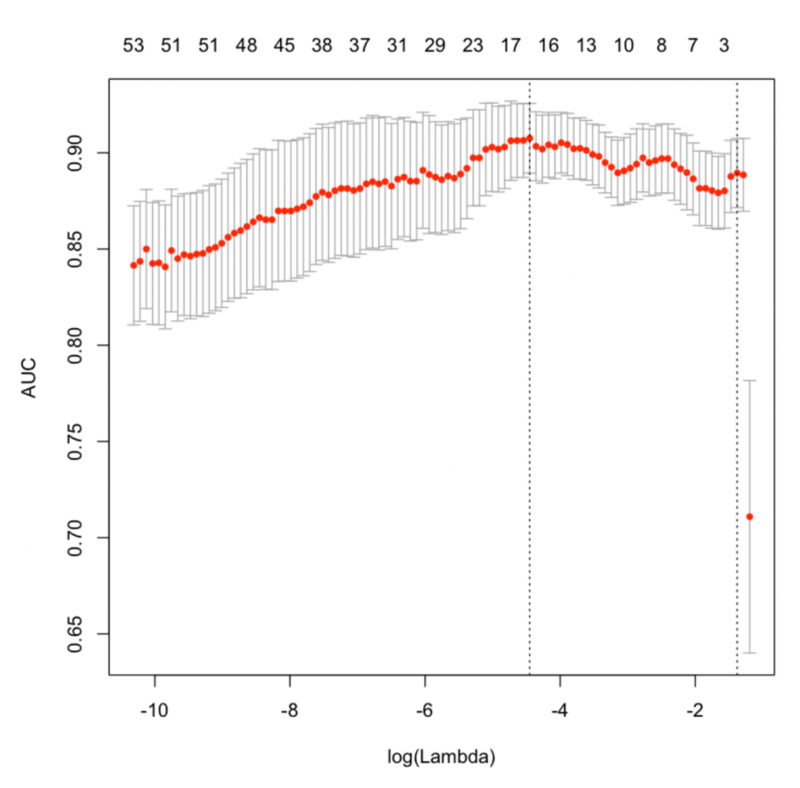 The X axis of the plot is the log of lambda. That means when it is 2 here, the lambda value is actually 100. The numbers at the top of the plot show how many predictors were included in the model. The position of red dots along the Y-axis tells what AUC we got when you include as many variables shown on the top x-axis. You can also see two dashed vertical lines. The first one on the left points to the lambda with the lowest mean squared error. The one on the right point to the number of variables with the highest deviance within 1 standard deviation. The best lambda value is stored inside 'cv.lasso$lambda.min'. The above output shows what variables LASSO considered important. A high positive or low negative implies more important is that variable. Stepwise regression can be used to select features if the Y variable is a numeric variable. It is particularly used in selecting best linear regression models. It searches for the best possible regression model by iteratively selecting and dropping variables to arrive at a model with the lowest possible AIC. It can be implemented using the step() function and you need to provide it with a lower model, which is the base model from which it won’t remove any features and an upper model, which is a full model that has all possible features you want to have. Our case is not so complicated (< 20 vars), so lets just do a simple stepwise in 'both' directions. I will use the ozone dataset for this where the objective is to predict the 'ozone_reading' based on other weather related observations. The data is ready. Let’s perform the stepwise. # Step 4: Get the shortlisted variable. The selected model has the above 6 features in it. But if you have too many features (> 100) in training data, then it might be a good idea to split the dataset into chunks of 10 variables each with Y as mandatory in each dataset. Loop through all the chunks and collect the best features. We are doing it this way because some variables that came as important in a training data with fewer features may not show up in a linear reg model built on lots of features. Finally, from a pool of shortlisted features (from small chunk models), run a full stepwise model to get the final set of selected features. You can take this as a learning assignment to be solved within 20 minutes. This technique is specific to linear regression models. 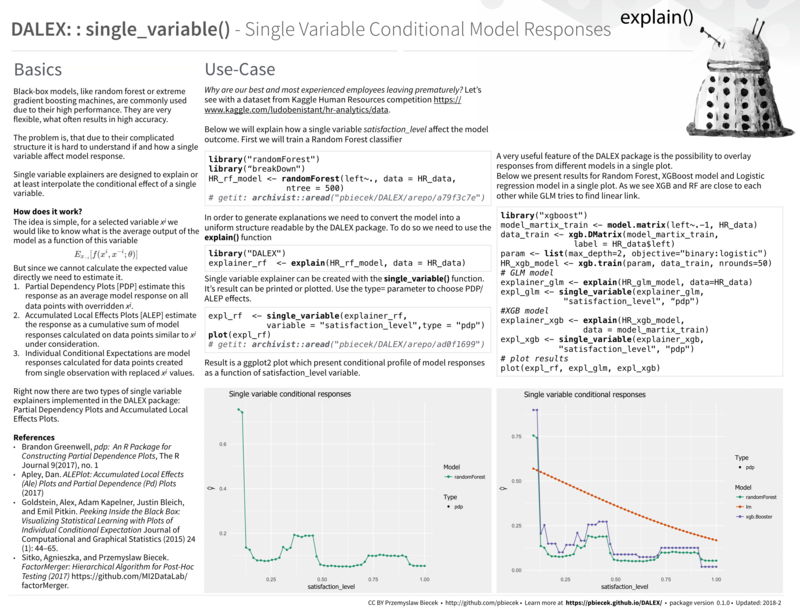 Relative importance can be used to assess which variables contributed how much in explaining the linear model’s R-squared value. So, if you sum up the produced importances, it will add up to the model’s R-sq value. In essence, it is not directly a feature selection method, because you have already provided the features that go in the model. But after building the model, the relaimpo can provide a sense of how important each feature is in contributing to the R-sq, or in other words, in ‘explaining the Y variable’. So, how to calculate relative importance? It is implemented in the relaimpo package. Basically, you build a linear regression model and pass that as the main argument to calc.relimp(). relaimpo has multiple options to compute the relative importance, but the recommended method is to use type='lmg', as I have done below. 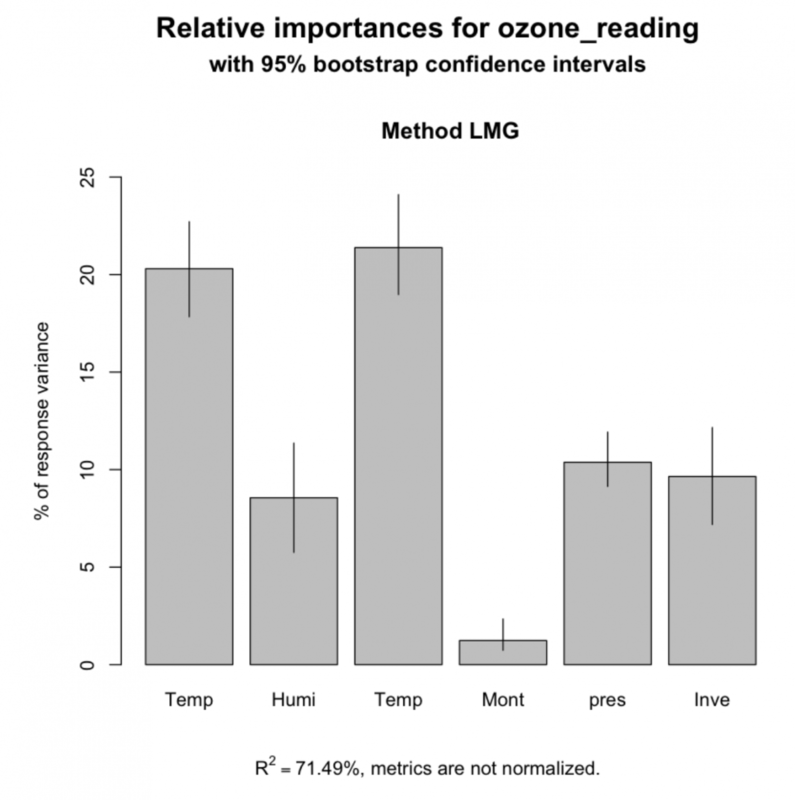 Additionally, you can use bootstrapping (using boot.relimp) to compute the confidence intervals of the produced relative importances. Recursive feature elimnation (rfe) offers a rigorous way to determine the important variables before you even feed them into a ML algo. It can be implemented using the rfe() from caret package. The rfe() also takes two important parameters. So, what does sizes and rfeControl represent? The sizes determines the number of most important features the rfe should iterate. Below, I have set the size as 1 to 5, 10, 15 and 18. Secondly, the rfeControl parameter receives the output of the rfeControl(). You can set what type of variable evaluation algorithm must be used. Here, I have used random forests based rfFuncs. The method='repeatedCV' means it will do a repeated k-Fold cross validation with repeats=5. Once complete, you get the accuracy and kappa for each model size you provided. The final selected model subset size is marked with a * in the rightmost selected column. So, it says, Temperature_ElMonte, Pressure_gradient, Temperature_Sandburg, Inversion_temperature, Humidity are the top 5 variables in that order. And the best model size out of the provided models sizes (in subsets) is 10. You can see all of the top 10 variables from 'lmProfile$optVariables' that was created using `rfe` function above. You can perform a supervised feature selection with genetic algorithms using the gafs(). This is quite resource expensive so consider that before choosing the number of iterations (iters) and the number of repeats in gafsControl(). ga_ctrl <- gafsControl(functions = rfGA,  # another option is `caretGA`. So the optimal variables according to the genetic algorithms are listed above. But, I wouldn’t use it just yet because, the above variant was tuned for only 3 iterations, which is quite low. I had to set it so low to save computing time. Simulated annealing is a global search algorithm that allows a suboptimal solution to be accepted in hope that a better solution will show up eventually. It works by making small random changes to an initial solution and sees if the performance improved. The change is accepted if it improves, else it can still be accepted if the difference of performances meet an acceptance criteria. In caret it has been implemented in the safs() which accepts a control parameter that can be set using the safsControl() function. safsControl is similar to other control functions in caret (like you saw in rfe and ga), and additionally it accepts an improve parameter which is the number of iterations it should wait without improvement until the values are reset to previous iteration. The Information Value can be used to judge how important a given categorical variable is in explaining the binary Y variable. It goes well with logistic regression and other classification models that can model binary variables. 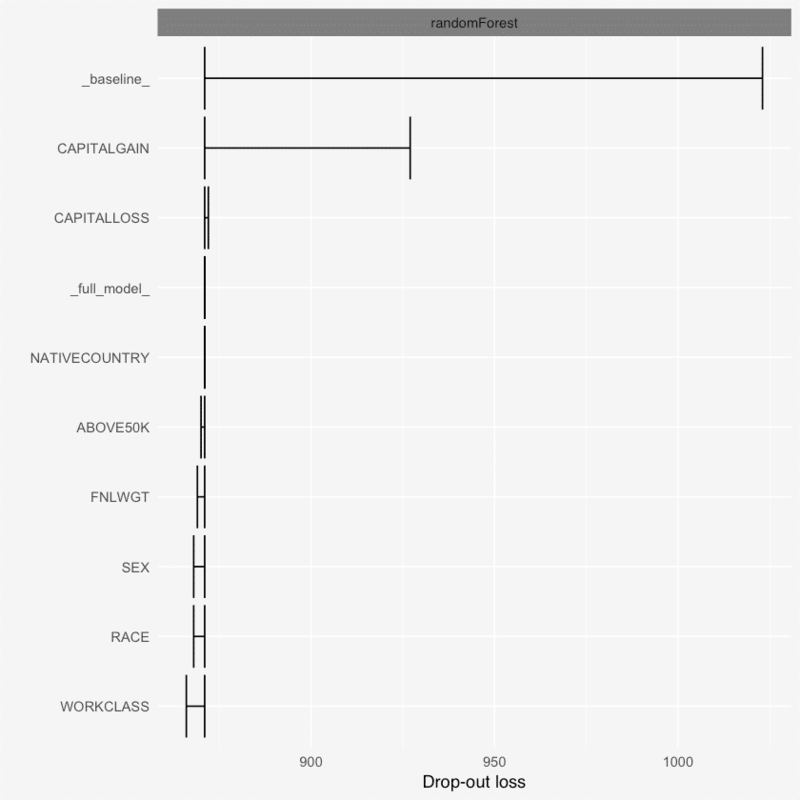 Let’s try to find out how important the categorical variables are in predicting if an individual will earn >50k from the ‘adult.csv’ dataset. Just run the code below to import the dataset. Alright, let’s now find the information value for the categorical variables in the inputData. 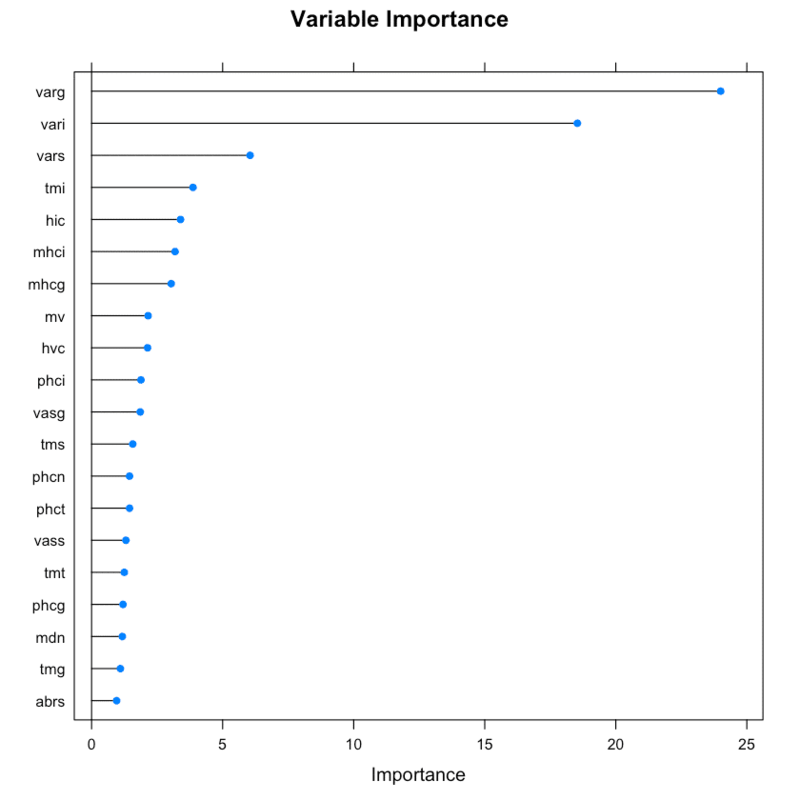 # Choose Categorical Variables to compute Info Value. 0.02 to 0.1, then the predictor has only a weak relationship. 0.1 to 0.3, then the predictor has a medium strength relationship. 0.3 or higher, then the predictor has a strong relationship. That was about IV. Then what is Weight of Evidence? The ‘Information Value’ of the categorical variable can then be derived from the respective WOE values. The ‘WOETable’ below given the computation in more detail. The total IV of a variable is the sum of IV’s of its categories. The DALEX is a powerful package that explains various things about the variables used in an ML model. For example, using the variable_dropout() function you can find out how important a variable is based on a dropout loss, that is how much loss is incurred by removing a variable from the model. Apart from this, it also has the single_variable() function that gives you an idea of how the model’s output will change by changing the values of one of the X’s in the model. It also has the single_prediction() that can decompose a single model prediction so as to understand which variable caused what effect in predicting the value of Y. Hope you find these methods useful. As it turns out different methods showed different variables as important, or at least the degree of importance changed. This need not be a conflict, because each method gives a different perspective of how the variable can be useful depending on how the algorithms learn Y ~ x. So its cool. If you find any code breaks or bugs, report the issue here or just write it below.